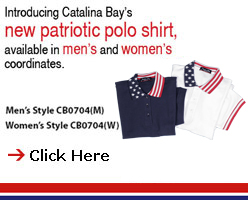 Catalina Bay is world-renowned for our quality knit sport shirts. With inventory at its highest levels, Catalina Bay is the promotional industry’s leading manufacturer of fashion and basic knit sport shirts. Our competitive pricing and custom capabilities should make us your choice for all your sportswear needs. Catalina Bay offers endless business opportunities for current and future customers with our own garment manufacturing facilities in Asia and warehouse in USA. This enables us to produce the best quality garments and offer you the most competitive prices. Our 82 Stock Styles, In-house Embroidery Facility and No Minimums makes us one of the most favorable supplier for any program fulfillment. RSS :: :: Catalina References :: Resources :: Sitemap Copyright © 2005 Catalina Bay USA, Inc.